ProPcCleaner is a PC optimization tool that has been categorized as a potentially unwanted program due to its suspicious functionality. Like other similar optimization tools ProPcCleaner is advertised as a program that will help your computer run faster; thus, numerous unsuspecting Internet users are misled into downloading a tool that does not do what it should. If you are eager to optimize your system’s performance, you should not trust ProPcCleaner as there are better programs that can be used for this purpose. If you wish to have a system free from any dubious programs, removal of this potentially unwanted program must be executed as soon as possible. Use the removal guide below and delete ProPcCleaner without encountering any major problems. Once this dubious program enters your PC, it will be started at each system startup because it will insert a system service to do that. 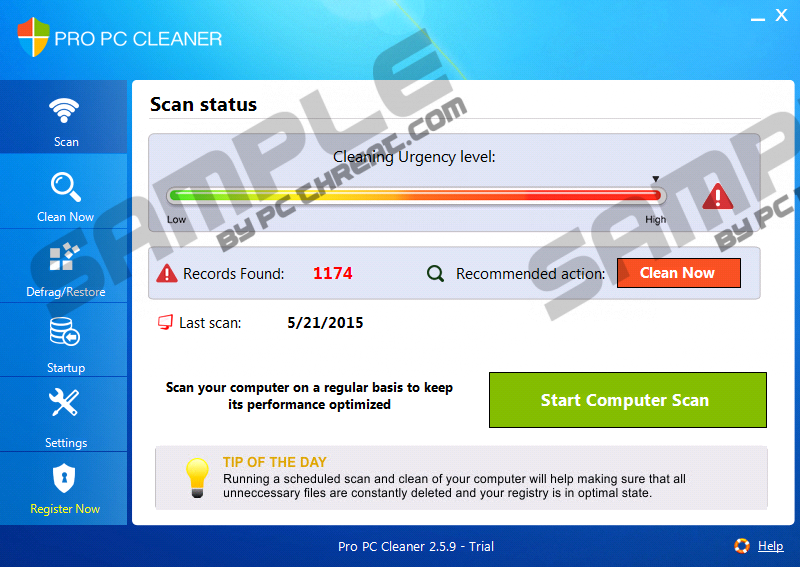 Once ProPcCleaner starts, it will scan your PC for alleged errors. After the scan, you will be provided with a list of errors that should be fixed to make your computer work faster. It has to be noted that during the research it has been discovered that most of the results provided by ProPcCleaner are rather questionable, to say the least. It has seen that some results include temporary files and registry entries that do not affect your PC in a negative way, what is even worse it has been noticed that some results are flat out fake. Due to this suspicious functionality we advise you not to use the questionable services that ProPcCleaner provides. If you want to maintain a system that is clean and secure at all times ProPcCleaner is not a program that should be used. In fact, it should be removed without any hesitation. Make sure to conduct a thorough removal of ProPcCleaner because it has been noticed that in quite a few cases leftovers of this program could still be active on your PC. If you want to be sure that ProPcCleaner was removed entirely, you will have to conduct a complete analysis of your PC looking for files or registry keys that might be linked to ProPcCleaner. If you do not feel comfortable doing that make sure to scan your PC with a professional antimalware tool as soon as manual removal has been performed. Select ProPcCleaner and then click the Uninstall button. Click Start and then select Control Panel. Quick & tested solution for ProPcCleaner removal.